12 Volt DC Hellfire Quartz heater ( PNP-202). Power Hunt's New Hellfire Heater PNP-202S generates instant heat and airflow feet away. The Hellfire heater uses quartz heating element technology that generates more than twice the amount of heat, than any other 12 Volt heaters, and by far it is the most powerful 12-volt heater (this needs to be qualified. See "How Much Heat" below). Great features to warm your campers, fishing shack, or deer stand. Save fuel and Sleep with engine shut off. The high technology carbon fiber allows it to put out substantially more heat while using less power than the older PNP201 heater (this needs to be qualified. See "How Much Heat" below). . The Hellfire also has an effective forced air fan and this combination creates heat that can be felt several feet away from the heater. The older version is still a good heater and is an excellent choice for the cost, but provides less than half the heat that the Hellfire produces. Does the Hellfire really generates more than twice the amount of heat, than any other heaters? 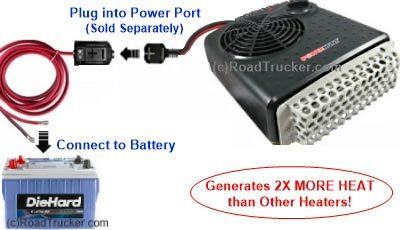 Is it really the most powerful 12 Volt Heater? How can a 500 watt heater put out more heat than a 600/700 watt heater? The answer is efficiency. 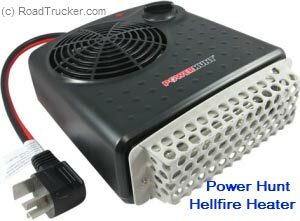 Power Hunt says "The new Hellfire is much more efficient than other heaters" like RoadPro's 300 watt or Power Hunt's 600 watt (700 at 14 volts). But wait a minute! Power is watts and heat is BTU and 1 Watt is approximately = 3.41214 BTU/Hr. Unless the science has changed the 500 watt Hellfire produces 500 x 3.4 = 1,700 BTU and the older 600 watt produces 600 x 3.4 = 2,040. 2,380 BTU at 14 volts. So technically, both statements above are false. If that's the case, then why does the Hellfire feel much hotter than the others? In fact, you can get burned with the Hellfire! The answer is that the Hellfire heats differently, then the RoadPro 300 watt and the Power Hunt 600/700 watt. The Hellfire does not heat the air, but instead heats objects. The Hellfire uses a quartz infrared radiant heat technology that is much more efficient, in the sense that the heat is not dispersed into the air, but instead is delivered more to any object in it's direct path. So as long as you are sitting in front of the Hellfire, it will keep you warmer than any of the other 12 volt heaters. NOTE: When you add your Power Hunt Hellfire Quartz Heater to the cart, we will also add a 12 Volt Power Port that hooks to the battery via 8' of wire with 2 connecting rings on the end. If you already have one, then click on "remove" in the cart to remove it before completing your purchase. First time Purchase of a Power Hunt Appliance will need the Power Port. Three heat level settings: HI, LO and FAN only. Can also be used for defrosting windshields.